It makes no difference if you are a beginner or a seasoned archer, your group will have a great time slinging arrows on one of the area's finest 3D archery ranges. You can let 'em fly at ground level or from one of our elevated platforms at targets from 10 to 50 yards consisting of deer, antelope, wild boar, black bear, coyote, and turkey. 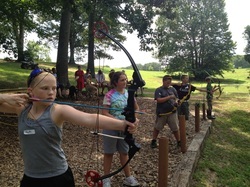 Supplied are compound bows and arrows, or you can bring your own archery equipment.